IPL uses intense pulses of light to heat dermal collagen, thus inducing a variety of cosmetic enhancements. Because it is essentially intense pulses of light containing a spectrum of wavelengths, it is not a laser. IPL can reduce sun-induced damage, even out pigmentation irregularities, remove vascular and pigmented lesions, decrease redness from Rosacea, and give skin a more youthful appearance. 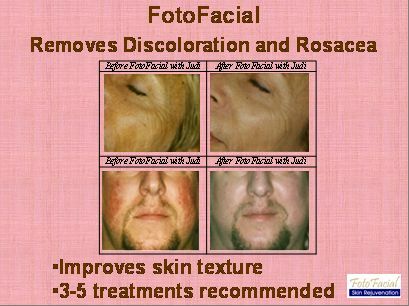 This form of treatment is good for the face, neck, chest, back and hands. © 2019 Academic Dermatology of Nevada.